Before we discuss how well the K-01 handles, we should perhaps address an issue that has caused a great deal of excitement – the camera’s appearance. How a camera looks is an entirely subjective issue, so I can only offer my personal opinion. To me, the box-like shape of the K-01 is reminiscent of the Rollei 35 range of cameras, and I would like to have seen a few more curves and design features to soften the edges. More importantly, the shape of the camera affects its handling. The K-01 offers very little in the way of grip, and I have seen larger, more shapely grips on compact camera models. The material used to cover the grip is ridged rubber, but this isn’t very grippy at all. While taking images is perfectly fine, the camera simply doesn’t feel comfortable to hold or carry. This same rubber material also acts as a cover for the USB and HDMI ports. However, it is loose, flimsy and wedges into place rather than actually being a door with a catch that closes and clicks shut. It can take a few seconds to make sure this rubberised cover is firmly sealed, which is quite annoying. The SD card socket is also under this cover, but thankfully it has its own more traditional sprung door with a catch. The buttons of the K-01 are well positioned. The exposure-mode dial can be reached with a forefinger while gripping the camera, and the shutter button is well positioned. On the rear of the camera is a fairly traditional button layout, with dual-purpose shortcut/directional control buttons and four separate buttons on the back for image playback, menu access, AEL/AFL and info. Although the way the buttons are laid out is neat, tidy and logical, the buttons themselves are too shallow and ‘clicky’. Thankfully, the shutter button functions a lot better and it is comfortable to use when half-pressing to focus. The two most noticeable buttons are the pair of red and green buttons on the camera’s top plate. The red button starts and stops video recording, while the green button is a function button. 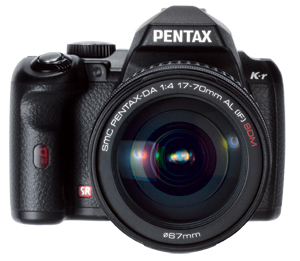 While the camera body may be new, the on-screen menus are lifted straight from Pentax’s K-series DSLRs. However, you are reminded that you are using the K-01 when you turn the camera on, and the signature of its designer and the name of the camera appear on the rear screen. When testing a compact system camera that does not have a viewfinder, I often instinctively hold it up to my eye – and I found myself doing this with the K-01. Aside from habit, I put this down to the fact that there is a viewfinder-style ‘bump’, that houses the pop-up flash, on top of the body, and the camera’s relatively large size. 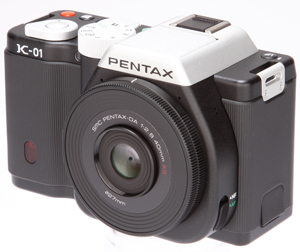 The K-01 isn’t all that much smaller than the Pentax K-r and, with a 16-50mm f/2.8 lens mounted, it feels as heavy as any enthusiast DSLR. Although the K-01 is straightforward to use, it is rather disconcerting that the small furrows and ridges found on almost all other cameras are missing. The fact that there are none of the usual contours for your fingers to grip onto or rest in makes the camera a little awkward, and even uncomfortable, to use.